As already stated earlier under this heading (Part 1), Ventarura is distinguished by a conspicuously differential persistence of tissues before silicification of the dead plant. 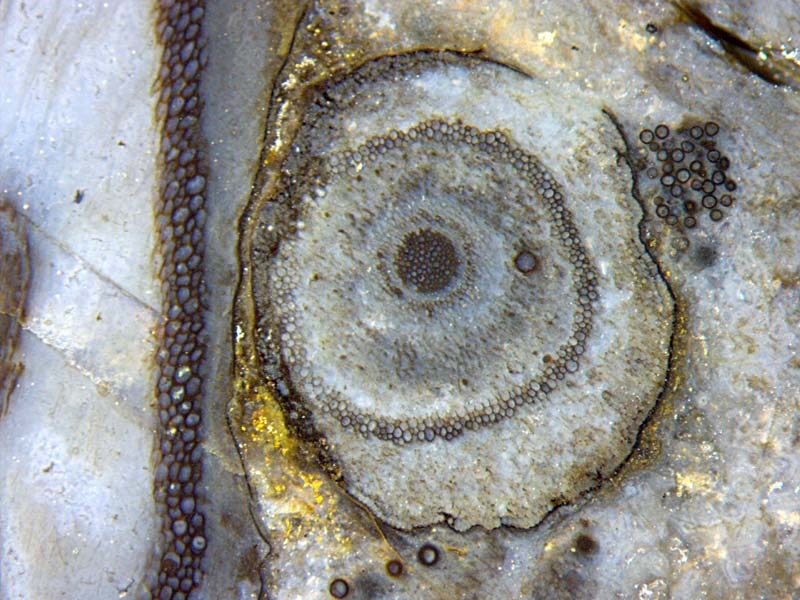 A cylindrical tube, seen on cross-sections as a concentric ring of well-preserved cells amidst decayed tissue, is always an indication of the presence of Ventarura in the chert sample. According to the palaeobotany literature the epidermis of Ventarura has never been seen [1,2]. For whichever reason, it had been preserved seldom. Meanwhile, it has been seen only twice when inspecting the surfaces and cut faces of about two dozen own chert samples with Ventarura. One is shown in Part 1, the other one in this contribution (Fig.1). Width of the picture 5.5mm. Incidentally, Fig.1 does not only show the epidermis along more than half the circumference of the cross-section. It also gives an impression of the variable aspect of the silicified plant. Partially seen on the left is an inclined cut of a shoot, width 5mm. The part of the elliptical section is nearly straight here due to deformation by contact with the shoot seen in cross-section. The latter is also deformed. Its original diameter appears to have been 3.3mm. Although it is not much smaller than the left one, the cells of its persistent ring are much smaller. The black coating is thin on the cell walls. No black coating is seen on the left side of the persistent ring and on the epidermis cell walls (Fig.2). The black coating is thick on the cuticle, on the nearby fungus spheres, and on the walls of the big cells of the shoot on the left. A black coating is also on the xylem cell walls and on phloem cells loosely arranged as a ring around the xylem. A few scattered dark dots are of a quite different nature, they are cells filled with dark fungus matter. The cortex has been subdivided into inner cortex, mid-cortex, outer cortex [1,2]. Apparently this subdivision is not meant to explain anything. It is only meant to assign names to the areas of the cross-section separated by the well-preserved ring called mid-cortex for this purpose. Fig.2 (below right): Components of partially degraded Ventarura cross-section: central xylem strand, phloem (partially with stained cell walls), decayed inner cortex with fungus hyphae, well preserved mid-cortex with cell walls coated and stained dark, decayed outer cortex, epidermis, cuticle coated and stained dark; fungus chlamydospores with and without dark coating. Width of the picture 2.2mm. In particular, the mid-cortex is not a separate tissue with definite boundaries since on either side of the mid-cortex there are always cells which do not belong to it as a whole but only with part of their walls. How this is brought about, and for what purpose, is still enigmatic. Lots of fungus hyphae, or the remains thereof, are seen randomly distributed, together with debris from the tissue, in the areas called the inner and the outer cortex. Traces of the former cortex tissue structure are still vaguely seen below the epidermis on the right. The thickness of the epidermis is rather uniform, about 70µm. The width of the elongated epidermis cells aligned along the shoot (see Rhynie Chert News 61, Figs.5,6) can appear variable, depending on their position with respect to the cut plane. In this sample the seldom preserved epidermis extends across the cut gap into the other slab but has not been traced farther. D. Edwards: Embryophytic sporophytes in the Rhynie and Windyfield cherts.